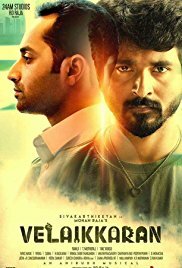 Velaikkaran (English: The Worker / Attendant) is an upcoming Indian Tamil-language action thriller film written and directed by Mohan Raja. Featuring an ensemble cast including Siva Karthikeyan, Nayanthara and Fahad Faasil in the lead roles. The film is based on two lookalikes Arivu and Azhagu and their battle against food adulteration. Also in the cast are Nayanthara, Sneha, Prakash Raj and others. The film has music and background score composed by Anirudh Ravichander. Cinematography is handled by Ramji. Produced by R.D Raja of 24 AM Studios. The show runs until December 28 at Cinecentre @ Suncoast with showings at 09h30 and 16h45.